March 17th through 19th Monster Jam World Finals XVII presented by NGK Spark Plugs returns to Sam Boyd Stadium on March 17th through 19th featuring top 32 Monster Jam trucks and drivers competing for the coveted titles of Racing World Champion and Freestyle World Champion. 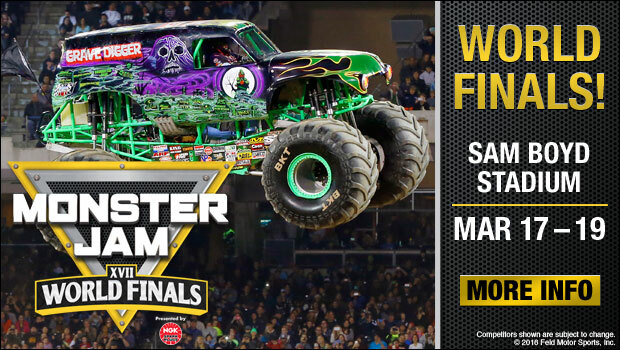 On Friday night the capacity crowd will be on the edge of their seats as Grave Digger, Max D and the fastest fleet of Monster Jam trucks ever assembled go head to head in their quest for the Racing World Championship. The incredible weekend of motorsports mayhem is appropriately concluded on Saturday night with the Freestyle Championship. Big air and big carnage is what Saturday night is all about as each of the 32 competitors take on an all-new freestyle course featuring outrageous obstacles and a battlefield of destruction never seen before. Both the Friday Racing Championship and Saturday Freestyle Championship begins with the Party in the Pits, which allows fans to interact with over 100 Monster Jam trucks and drivers. The Party in the Pits also features thrill acts, main stage activities, live band, vendor booths and other activities. The Party in the Pits is free with a Monster Jam World Finals event ticket. Get your tickets today at MonsterJam.com or UNLVtickets.com. Get $15 off two-day tickets - Get $15 off two-day tickets. Use code: MJMOM. Not valid on Double Down Packages. I definitely dream about going to this party place again. The live music at the venues was an added bonus, providing a backdrop for the fun hours spent imbibing, tasting, and chatting up with the breweries and beer distributors. The Harlem Globetrotters in Vegas!